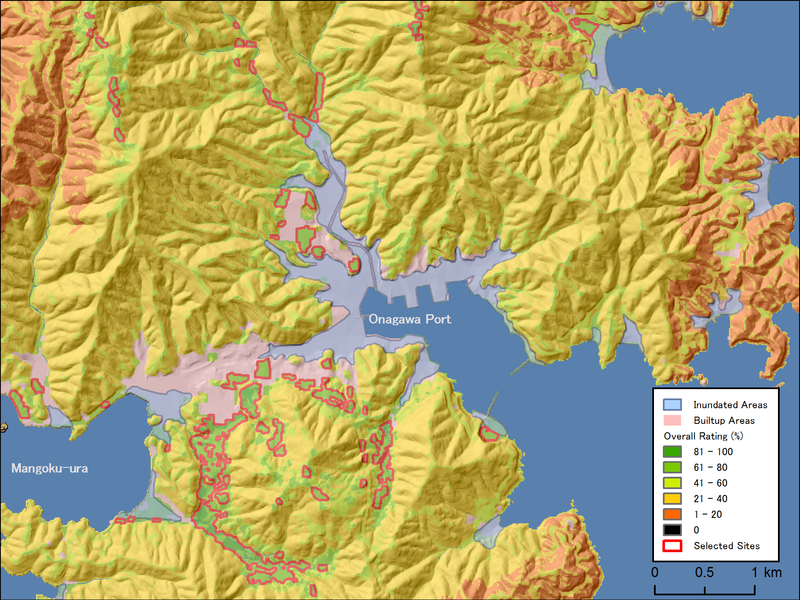 In ria inlets of the Sanriku Coast, much of the entire urbanized area is swept away from the tsunami which include Onagawa Town in Miyagi Prefecture. The prefecture now bans new construction in urban areas severely damaged by the tsunami (Miyagi Prefecture, 11 May 2011), at least until 11 September 2011, and even considering the ban for unlimited period (Asahi Shinbun, 29 April 2011). The emerging idea for reconstruction of the town is to move the whole town up the hill to prevent damages from the recurring tsunami. The damage has been so severe because ria inlets have very little plain and built up areas concentrated there, but ironically, this means that the area has very little alternative land to build new towns. 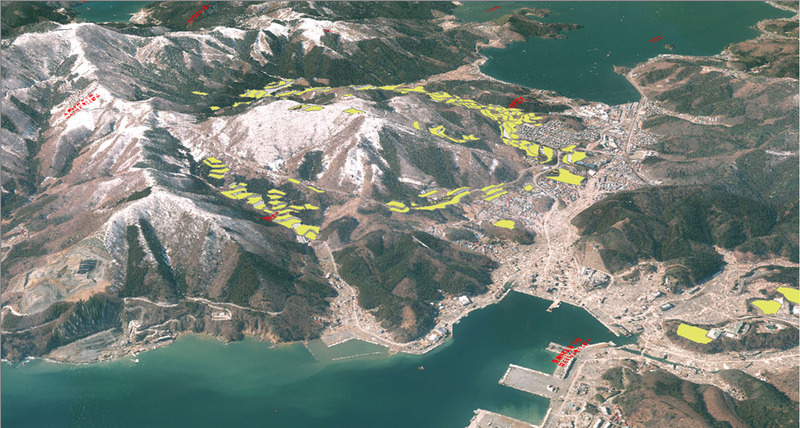 This article takes 'cartographic modeling' approach in GIS to algorithmically search for possible replacement area for the tsunami-hit town center of Onagawa Town. Onagawa Town had 10,051 population in 1 October 2011 of which 11% died or missing from the tsunami. 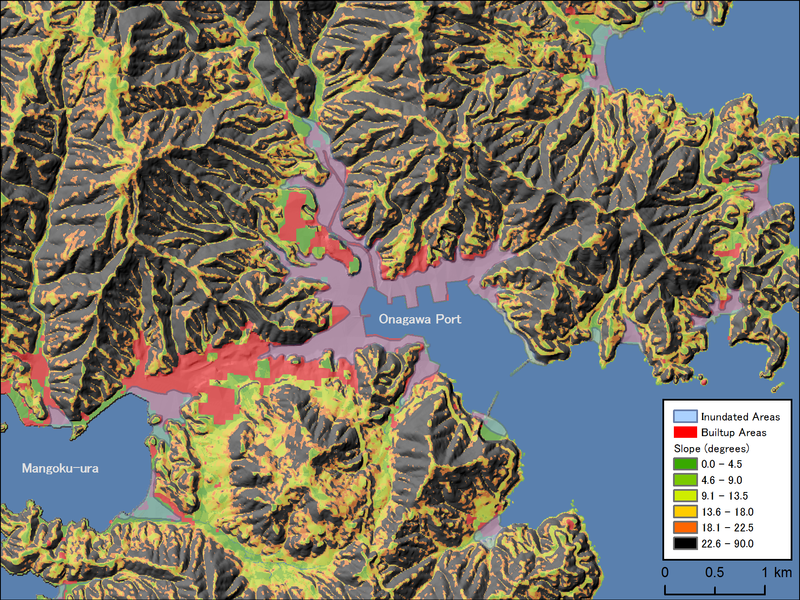 The wave height was about 15 m (The 2011 Tohoku Earthquake Tsunami Joint Survey Group) at the Onagawa Port, and almost all plains were inundated, including 116.4 hectare of built-up area in the main inlet area. The area is in short of moderate slope, let alone flat plain, but the goal of this article is to find alternative land for this 116.4 hectare of built-up area. As almost all existing flat surface is already built-up, there is a need to create flat surface through artificial modification, and we consider terracing the slope by land cuts. Assuming a retaining wall of 7 meters (about two stories high) for terraces, the slope to create terrace should be less than 22.5 degrees in order to secure terrace depth for a house and an access road. For this reason, the slope more than 22.5 degrees is rated 0% (unable to create flat surface) and slope of 0 degrees is rated 100%, and the rating for slope in between is linearly attached. Development in miniscule sites can occur individually but for collective development, the candidate site has to have more than a certain area. 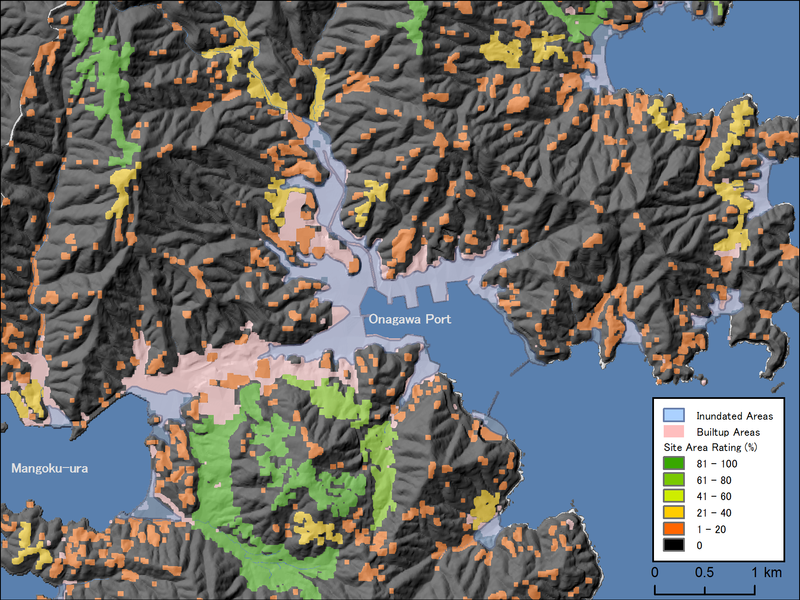 We define the extent of the site by spatially continuous region delimited by slopes more than 22.5 degrees (see above), and calculate area for each region. We rate 0% for sites less than 0.20 ha (equivalent to a typical street block) and 100% for areas greater than 30 ha (area considered to be large enough for collective development under existing land planning law); rating for area sizes in between are linearly attached. Onagawa Port for fishery and aquaculture is expected to play central role in Onagawa economy as it has been the raison-d'etre of the town. Commuting to the Port area would be the daily routine for the Onagawa citizens so the distance to the existing town center seem to be very important. 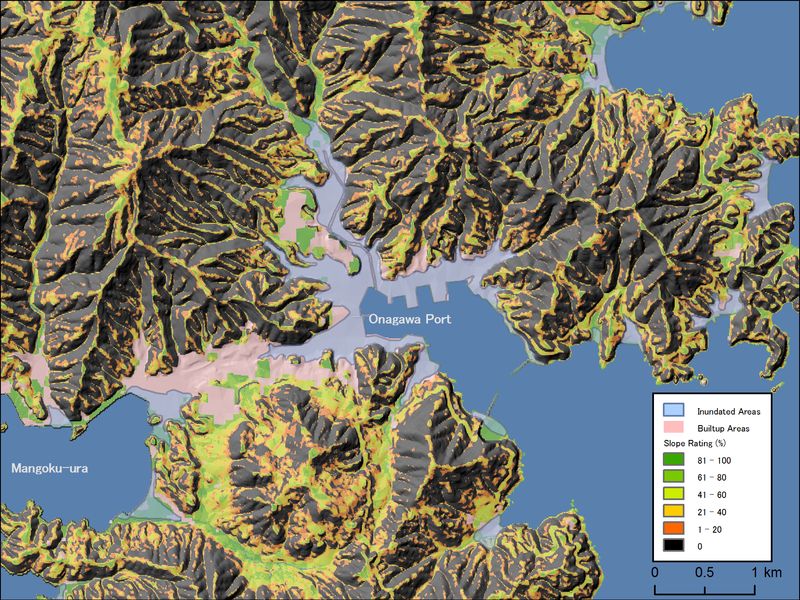 I calculated cost distance from the inundated built-up area, assuming that travelling vertically is 10 times more costly than travelling horizontally, and locations were rated 0% for 0 km, and 100% for 15 km. The weight for site area is lowered because this condition is tricky as the shape of the site also matter. For example, long and narrow sites found along mountain ridges had ample size but such site does not seem to be favorable for development; a better indicator for site area and shape must be created. The overall rating is shown in figure 3. We find large chunk of relatively highly rated sites around the low mountain in Washinokami Aza, southwest of Onagawa Port, and it seem to be a good candidate for the new town. But to maintain being algorithmic, we select the best rated sites until we reach the target area of 116.4 ha. Finally, by terracing the selected sites by land cuts, we ended up with 89.6 ha of plots for development (Fig 2). The area is less than we initially targeted, as I have forgotten to take account the area needed to make retaining walls for each terrace. The total amount of earth needed to be removed to make terraced plots was 3.3 x 106 m3. 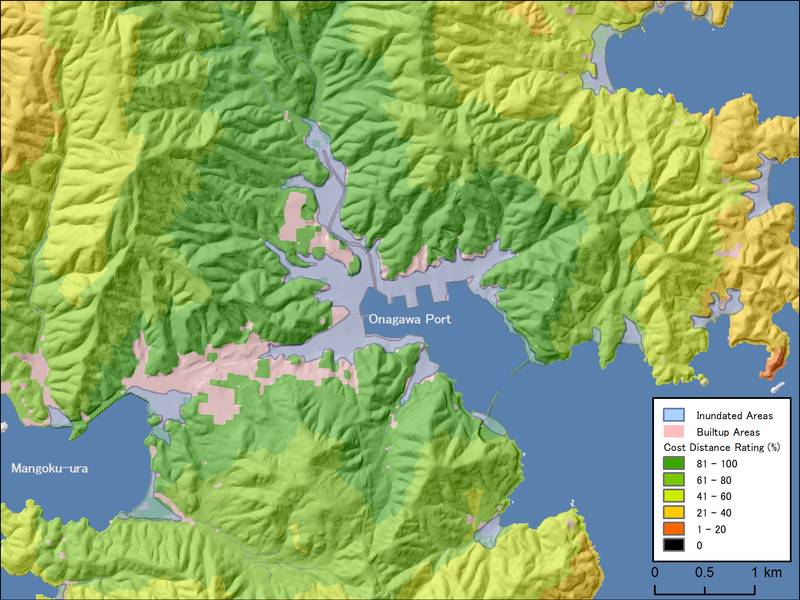 This is the amount equivalent to fill the lowest parts of inundated built-up area of the main Onagawa inlet to 10.1 m; then the lowland will become safe to most tsunami.